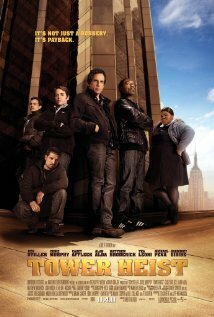 Tower Heist is worthy of watching and it’s worthy of eight out of a potential ten Steeler Stars so that proves just how worthy this flick is worth watching. Have I said ‘worthy’ enough already??? Sheesh. Anyhow, I had no preconceived notions going into this film when Brandee flicked on the Roku. As the intro’s began to roll I saw that Ben Stiller and Eddie Murphy were featured so I immediately downgraded my Steeler Star-rating by two full stars! While I like both actors too often their movies become too slap-stickish for my tastes, however, Tower Heist was just the right mix of slap-stick but also serious action and drama. It worked well. The movie had a lot of big name actors aside from Ben and Eddie including Matthew Broderick, Alan Alda and Judd Hirsch, among others. I think they all played their characters extremely well and they were absolutely believable. Most of these guys are known for their previous comedic roles in TV and movies so Tower Heist had the potential to be a corny disaster but it turned out surprisingly well. There was actually a good plot with many twists-and-turns. I felt it never went overboard on some of the quite hilarious jokes. It was simply the right mix. In the end the combination of good actors, good story writing about corruption and greed, as well as a great moral about finding decency in people packed into this 104 minute entertaining movie makes Tower Heist a wonderful investment of your time.